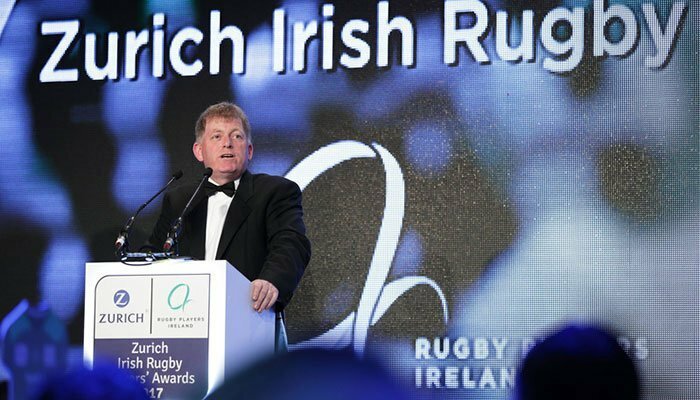 The Zurich Irish Rugby Players' Awards played homage to Ireland's legendary rugby players with the awards ceremony celebrating sporting achievements, dedication and commitment. Munster and Ireland's Conor Murray was voted the Zurich Players' Player of the Year 2017 by his fellow players at the annual Zurich Irish Rugby Players' Awards last night. Murray, who was recently called up to Warren Gatland's British and Irish Lions squad, has become integral for both club and country and is widely regarded as one of the best scrum-halves in the world. Murray, outstanding as Ireland claimed their first ever victory over the All Blacks in Chicago, continued his fine form into the Six Nations, whilst he also fronted Munster's march through the Pro12 season. Murray won the award ahead of Munster teammate CJ Stander and Leinster's Robbie Henshaw, while Tadhg Furlong - who was also nominated - took home The Irish Times Supporters' Player of the Year 2017. Meanwhile, Garry Ringrose was named as the Nevin Spence Young Player of the Year 2017 after cementing his place in the Irish midfield and further impressing for Leinster as they progressed to the latter stages of both domestic and European competition. The award was presented by Spence's former teammate, Craig Gilroy. All players in the mix for these awards should expect to be involved when Ireland travel to 2019 Rugby World Cup in Japan. The draw, which took place in Kyoto on the same day, pits Joe Schmidt's team against Scotland and their Japanese hosts, whom they will also visit in the coming weeks. On receiving his award Murray commented: "It has been an incredible season and one that I have thoroughly enjoyed. We have had our challenges and some sad days along the way, but to have both Munster and Ireland performing at the highest level has been very satisfying. Being recognised in this way by my peers is special - I just hope that I can continue to do my job in the important games that are to come." The Zurich Contribution to Irish Society, was presented to both Hannah Tyrrell and Jake Heenan in recognition of their work in their respective communities, and in particular as Tackle Your Feelings ambassadors. Speaking at the awards Anthony Brennan, CEO of Zurich in Ireland said: "I wish to extend my congratulations to all of those taking home prizes tonight - and to all of those who were nominated. The young men and women involved in rugby continue to be role models for so many people here in Ireland and true ambassadors for our country. Zurich is absolutely delighted to sponsor these Awards, recognising achievements both on and off the pitch. We look forward to continuing our support of Rugby Players Ireland and the Tackle Your Feelings campaign, which we hope will continue to improve our attitudes and approach to mental health here in Ireland." Joining Ireland's heroes in the BNY Mellon Hall of Fame was former Leicester and Ireland full-back Geordan Murphy. Connacht's Ronan Loughney, a member of the Rugby Players Ireland Executive Board, was awarded the Vodafone Medal for Excellence, which rewards on-field effort combined with off-field commitment to the game. The BNY Mellon Women's XVs Player of the Year 2017 - as voted by members of the Ireland squad - was presented to Lindsay Peat for several outstanding performances in what is a momentous year for the women's game in Ireland. For the second year in a row, Amee-Leigh Murphy Crowe claimed the Mason Alexander Women's 7s Player of the Year. "Winning a Rugby Players Ireland award is one of the highest honours a player can receive in the game here in Ireland", Simon Keogh, acting CEO of Rugby Players Ireland said. "There have been many great achievements by Irish players this year, but to be acknowledged by your teammates and opponents in this manner shows just how much of an impact you have made throughout the season. I am thrilled for Conor who has enjoyed a fantastic season, reaching a level of consistency that few can match." While both the men and women just fell short in their respective Six Nations campaigns, there were several moments throughout the season that will always be remembered fondly. Members of the public decided that Ireland's victory over the All Blacks was the Druids Glen Hotel & Golf Resort Rugby Moment of the Year via Twitter. The award was collected by Donnacha Ryan who played a significant role in the Soldier Field win. Rugby Players Ireland is the representative body for Ireland's professional rugby players and strives to make Ireland the best place in the world to play rugby. The association also focuses on player development and ensures that the profile enjoyed by Ireland's rugby players contributes to the future development, not just of Irish rugby, but Irish society as a whole. This can been seen in its Tackle Your Feelings mental wellbeing campaign.